This page shows some projects I have made in Indonesia. I here attache two projects of dwelling houses which were built in Jakarta and Surakarta (Solo, Jawa Tengah/Central of Java), Indonesia in 2008. Beside, I also wrote some books of CAD, ITs and Electronic Guidances. The CAD training programs which organized by the government office and the university (in where I was appointed as a CAD instructor) in 2001-2008. And the Computer Application programs I have made in 1999-2005. This design was submitted to join ZWCAD 2009 (China) CAD Design Contest in January 2009 at: http://www.zwcad.org/cadcontest/voteshow.asp?id=183 and was appointed as the 5th of 12 top excellent designers of the contest. This drawing shows a design of a two floors residential building (lower level wall is constructed using red brick and upper level wall is constructed using wood) on the front side, a small office on the right side and a warehouse on the back side. All the buildings floors have the area of about: 319.11 sq meters, will be built on the existing land in East of Jakarta with the area of: 964.00 sq meters. There are 9 bitmap pictures of this design. 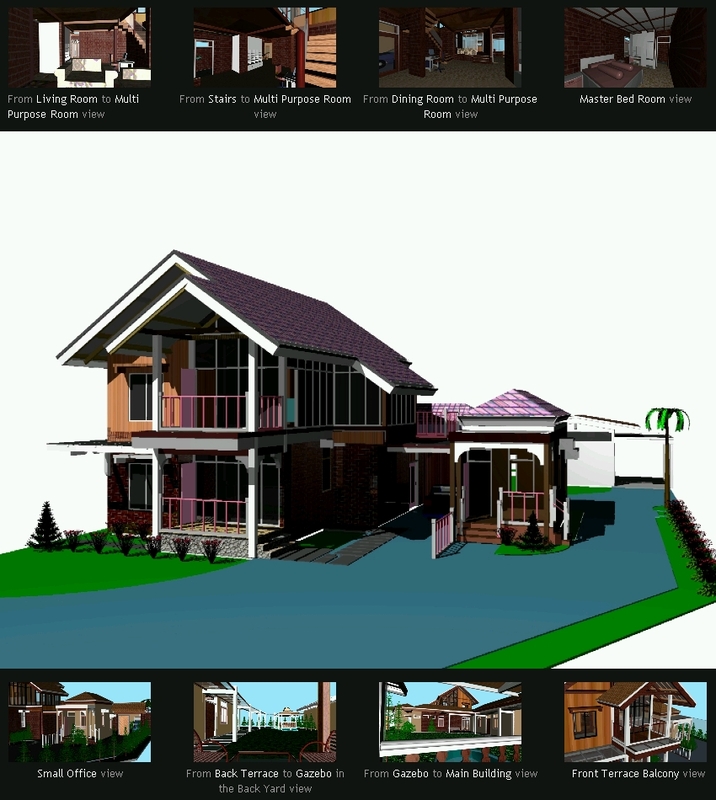 This design of a single dwelling house with the area of: 124.00 sq meters still being constructed (by June 20, 2009 has been 75% finished) in Surakarta (Solo), Central of Java, Indonesia. The house consists of three bed rooms, two bath/showers, kitchen and dining, living and family rooms, maid room with bath room & washing area and the carport. The house is built on the area of: 169.00 sq meters of an existing land. There are 9 bitmap pictures of this design. instruction modes and initializations. Starting with introduction to draw 2D geometric base shapes: lines, triangles, squares, polygons, circles, ellipses - continued with 3D solid shapes: boxes (cubes), spheres, cones, cylinders, ring or wheel shapes, wedges, extruded, rotated and union. Also common instructions in editing the drawing so that you'll be able to utilize the capabilities of CAD optimally. (The book size: 148 x 210 mm, 454 pages, with color soft cover). Furniture is insepareble part of the art of Building Architecture Design. In this book you are guided on how to design 3D solid various building interior appliances (using the sample house in the previous book) complete with the frames structures and finishing material textures used. (The book size: 148 x 210 mm, 450 pages, with color soft cover). All the books are prepared and distributed locally - only for people who join the trainings at LP3-JBS Training Institution in Jakarta, Indonesia. For a complete list of the books, you can download it from here. 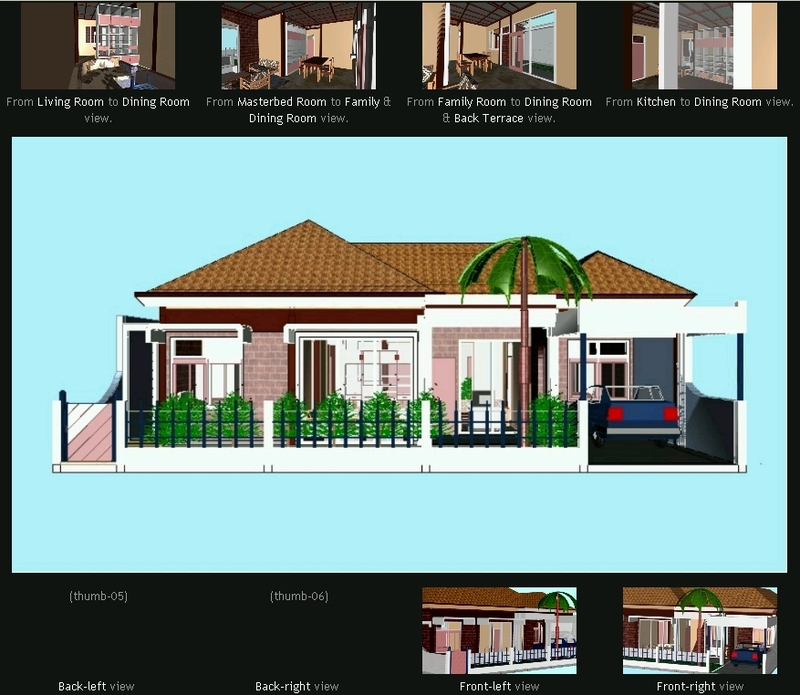 proportional perspective view, rendering with applying real material textures (from library or your own made) to the building components, so that the rendering result of your designs will look like reality. And a layout consists of one or more views (in square, circle or other undefined shapes) is ready for printing or realtime presentation of the design.Not only those mentioned above, you are also guided to calculate the mass or volume of the building components so that the results can be used for calculating the building construction cost plan. (The book size: 148 x 210 mm, 444 pages, with color soft cover). camera turning around the object design, so that the viewers can see your design object from every (multiple) angles; camera to go forward to & to go backward from the design object; camera panning to the left & right and camera gazing upward and bending downward. All of those effects are completing the way you show your design in today's trend presentation: animations! The results can be saved into your flash disk so that easy to bring and show them whenever and wherever! Show them to your clients with this sophisticated way of presentations! Animations! Toys Industry's Man Power Skills Upgrading - CAD Training, in 2001; Dwima Hotel & Resort, Cipayung, August 27, 2001-September 12, 2001; with the participants of employees of Toys Industries in Jakarta, Bogor, Tanggerang & Bekasi, Indonesia - Organized by: Directorate of Multi Various Industry, Directorate General of ILMEA (Metal, Machine, Electronic and Multi Various Industry), Department of Industry of Indonesia. New Entrepreneurs Development of Toys & Garment Industries' CAD Training (1st session), in 2002; Dwima Hotel & Resort, Cipayung, Bogor, Jawa Barat, August 12-15, 2002, with the participants of employees of Toys & Garment Industries in Jakarta, Bogor, Tanggerang & Bekasi, Indonesia - Organized by: Directorates of Multi Various Industry & Textile Industry, Directorate General of ILMEA (Metal, Machine, Electronic and Multi Various Industry), Department of Industry of Indonesia. New Entrepreneurs Development of Toys & Garment Industries' CAD Training (2nd session), in 2002; Dwima Hotel & Resort, Cipayung, Bogor, Jawa Barat, August 29-September 2, 2002, with the participants of employees of Toys & Garment Industries in Jakarta, Bogor, Tanggerang & Bekasi, Indonesia - Organized by: Directorates of Multi Various Industry & Textile Industry, Directorate General of ILMEA (Metal, Machine, Electronic and Multi Various Industry), Department of Industry of Indonesia. Toys Industry's Man Power Development - CAD Training (1st session) in 2003; Karawang Indah Hotel, Karawang, August 20-23, 2003; with the participants of employees of Toys Industries in Jakarta, Bogor, Tanggerang & Bekasi, Indonesia - Organized by: Directorate of Multi Various Industry, Directorate General of ILMEA (Metal, Machine, Electronic and Multi Various Industry), Department of Industry of Indonesia..
Toys Industry's Man Power Development - CAD Training (2nd session) in 2003; Dwima Hotel & Resort, Cipayung, September 09-12, 2003; with the participants of employees of Toys Industries in Jakarta, Bogor, Tanggerang & Bekasi, Indonesia - Organized by: Directorate of Multi Various Industry, Directorate General of ILMEA (Metal, Machine, Electronic and Multi Various Industry), Department of Industry of Indonesia..
Optimizing CAD Design Capabilities in Designing Real 3D Building Architecture, for Architecture Lecturers and Student of University, in 2008; CAD Digital Studio, Department of Architecture of Pancasila University - Jakarta, January 14-17, 2008, with the participants of The Lecturers and Professional Architects - Organized by: Department of Architecture of Pancasila University Jakarta in cooperation with LP3-JAKA BUANA SAINS Training Institution Jakarta. I am also very fond in making computer application. I have ever made some computer applications, like: MRP (Material Requirement Plan), which was sold and set to a Felxible Intermediate Bulk Container (FIBC) or Polypropylene Bulk Bags factory (PT. Marsol Abadi Indonesia) in Cikarang-Bekasi, Indonesia in 2002; some database programs and a website portal of Indonesian Electronic Industry (e-ITI, Library call code: 001.5 Pen) have been utilized in the Directorate of Electronic, Directorate General of ILMEA (Metal, Machine, Electronic & Multivarious Industry), Departement of Industry of Indonesia in 1999-2005.